Ptolemaei Planisphaerium. Iordani Planisphaerium. 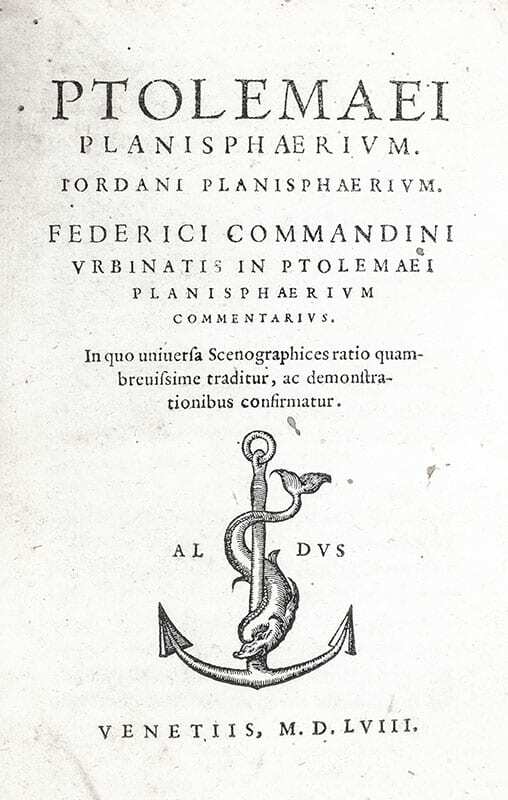 Federici Commandini Urbrinatis in Ptolemaei Planisphaerium Commentarius. Ptolomaeus, Claudius. Edited and with Commentary by Federico Commandino. Venice: Paulus Manutius (Aldine Press), 1558. 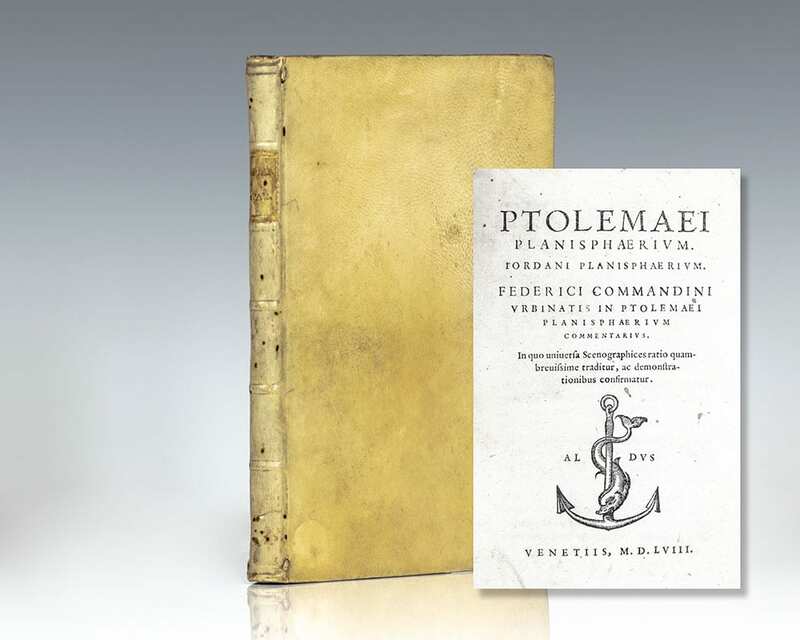 First separate edition and first edition of Commandino’s commentary of Ptolemy’s Planisphaerium, the original Greek text of which is no longer extant. Octavo, two volumes bound into one in eighteenth century vellum, all edges speckled red, Aldine device on both titles and both final pages, woodcut initials, numerous woodcut diagrams. The Ptolemaei is printed in Roman type and the Planisphaerium in Italics; examples from the Aldine Press in Roman type are scarce as the press’s founder, Aldus Manutius, invented the Italic type which he used almost exclusively. The Aldine press was also the first to issue printed books in the small octavo size. After Aldus’ death in 1515 the press was continued by his wife, Maria and her father, Andrea Torresani, until his son, Paulus Manutius (1512–1574) assumed management in 1534. It is from this era that most, if not all, of the works from his press bear the imprint In Aedibus Haeredum Aldi et Andrea Asulani Soceri. In near fine condition with minor marginal dampstaining to a few pages. Exceptionally rare and desirable. Originally written in Ancient Greek, Ptolemy's 12th century Planisphaerium was one of the major scientific works that survived from antiquity in Arabic translation. An exploration of the mathematics of mapping figures inscribed in the celestial sphere, the Planisphaerium attracted interest because stereographic projection was the mathematical basis of the plane astrolabe, an instrument which was widely used in the medieval Islamic world. This Latin version, along with Jordanus de Nemore's work on the same topic, was first printed in Basel in 1536. The editor of the present volume, Federico Commandino, was a physician to the Duke of Urbino at his household in Rome, and the author of several translations of ancient Greek mathematical treatises and commentaries published in the early 16th century. In working with Ptolemy's stereographic projection of the celestial sphere on a plane with the south celestial pole at the center, Commandino noticed that conic sections could be considered sections in visual cones or perspective images. 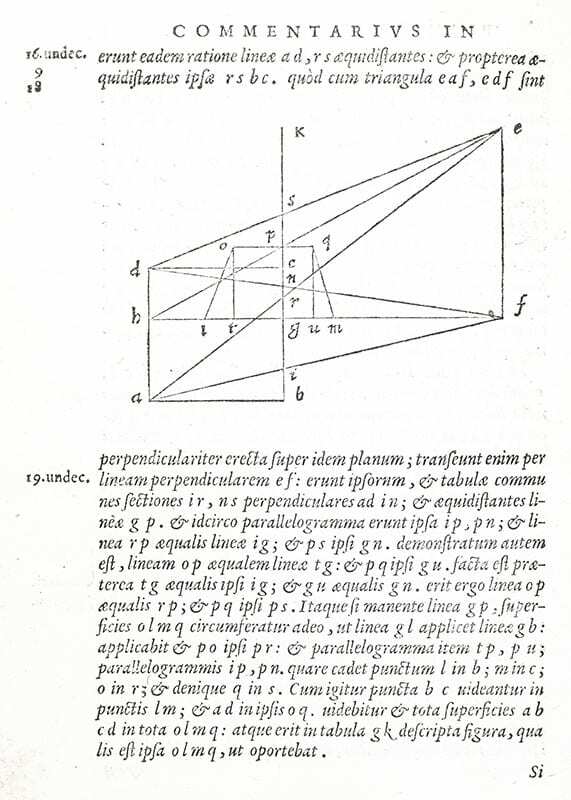 This inspired him to include in his work a study of perspective, which occupies the majority of his commentary and represents one of the earliest mathematical formulations of a method already widely employed by artists (Adams P2242; Censimento 16; CNCE 28281; Renouard 1558/4; Ahmanson-Murphy/UCLA 449; Houzeau & Lancaster 769; Honeyman 2557; Riccardi I, 360, 1). 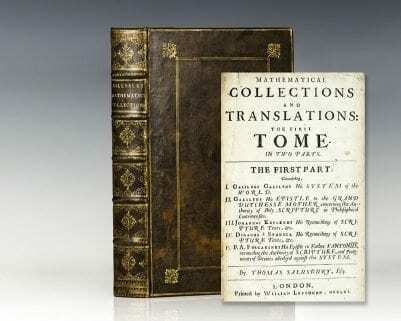 First edition of Thomas Salusbury’s Mathematical Collections and Translations. Salusbury compiled and translated important writings by Archimedes, Descartes, Galileo, Kepler, Tartaglia, Torricelli into English for the first time, greatly influencing the English-speaking world. This volume contains the first English translation of Galileo’s 1632 The Dialogue Concerning the Two Chief World Systems (Dialogo sopra i due massimi sistemi del mondo). Also included is Galileo’s 1615 letter to the Grand Duchess Christina of Tuscany, published in 1636 as Nov-antiqua sanctissimorum patrum et probatorum theologorum doctrina, which asserted the independence of science from religious authority. This short but important Epistle to the Grand Dutchesse Mother concerning the Authority of Holy Scripture in Philosophical Controversies (known today as the Letter to Christina), was only the second work of Galileo’s to be published in England. 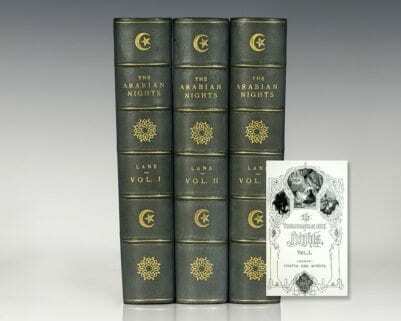 It preceded the Latin edition, published in London by Thomas Dicas, by two years and remained the only vernacular translation for two centuries. Apart from the two works by Galileo, Salusbury included other translations from Italian and Latin in this volume of his Collections, such as Johannes Kepler’s and Didacus a Stunica’s “Reconcilings of Scripture Texts,” and Foscarinus’ Epistle to Father Fantonus reconciling the Authority of Scripture. 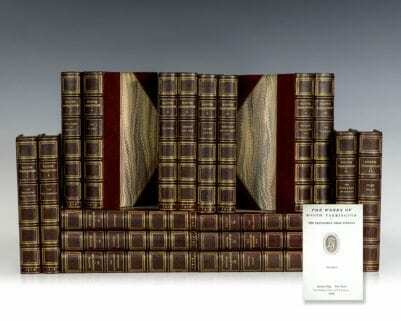 Folio, bound in full calf, with 4 engraved plates. Lacking the half-title, contents leaf, fly-title to The System of the World, and the errata leaf found at the end of the first part in some copies. 2 parts in one volume. In very good condition with the contents showing some light browning in the upper margins. First editions are exceptionally rare.